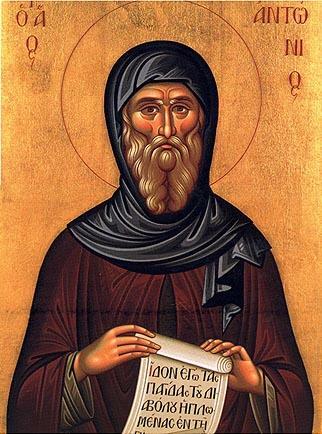 Saint Anthony the Great is considered the founder of Christian monasticism. He was born near Memphis in central Egypt about the year 251 to a well-to-do Christian family. He was left an orphan at an early age. In church one Sunday, when he was about twenty years old, he heard the words of the Gospel, "If you would be perfect, go, sell what you possess and give to the poor, and you will have treasure in heaven; and come, follow me" (Matthew 19: 21). Without hesitation Saint Anthony literally obeyed the words he had heard and disposed of all his possessions. He went out into the desert to live a life of prayer, fasting, and manual labor. At first he was plagued by many temptations, but by the grace of Christ he overcame them. He returned to civilization only twice, to aid suffering fellow Christians during the persecutions instigated by the Emperor Diocletian and to support Orthodoxy against the Arian heresy, which denied that Christ was God. As Saint Anthony's reputation for holiness spread, others went out to share his way of life and to learn from him. So many gathered around that he began to miss the solitude of the early years. He withdrew deeper into the desert, to a cave in a remote area near the shore of the Red Sea, where he spent the rest of his life. Saint Anthony's biography was written by Saint Athanasius, the great archbishop of Alexandria, who knew him personally and relied on him for support and advice. Saint Anthony died in the year 356. His feast day, our parish patron feast, is January 17th. Imitating the zealous Elijah in behavior and following the Baptist on the straight path, you became an inhabitant of the desert, O Father Anthony, and by your prayers you made secure the whole world. Therefore, intercede with Christ our God that our souls may be saved! Having rejected the turmoil of a worldly life, you achieved true life by inner stillness, O most venerable one, imitating the Baptist in every way. Therefore, we honor you with him, O Father of Fathers, Anthony!